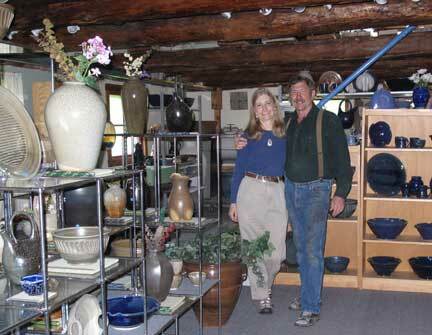 Our pottery studio & showroom are located on Vermont Route 116, five miles "north" of the village of Bristol. 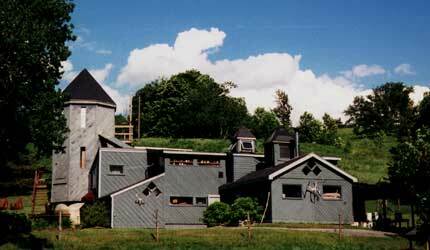 Robert moved here in 1973 and set up a pottery stand outside the barn, which was his studio. Today we show a variety of his work, from functional stoneware pottery fired in his wood and gas fired kilns, decorative Raku and Pit Fired pots as well as his well known Fountains & Aquariums. 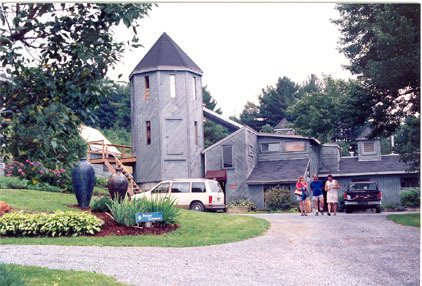 The unusual building that houses our pottery studio & gallery has evolved over the more than 40 years of Robert's career in clay. The old silo foundation was used to build a tower that houses packing materials and glaze materials. The section closest to the road is the "kiln building" which houses our Gas Fired Car Kiln. Within these walls covered with diagonal siding is our gallery/showroom filled with pottery. The pottery is open most days from 10-5. It is best to call ahead to make sure we're here.